What makes something art? Is it beauty? Is it in the eye of the beholder? Is it because it is original and creative? It’s an old question that has as many answers as there are people asking it. A common definition is “The expression or application of human creative skill and imagination, typically in a visual form such as painting or sculpture, producing works to be appreciated primarily for their beauty or emotional power” and I have to agree with that. To me, art is a visually appealing (or interesting) original creation, even though it may not always fit the definition of “pretty”. Did you know that many restaurants replace their silverware on a regular basis (at least once a year)? 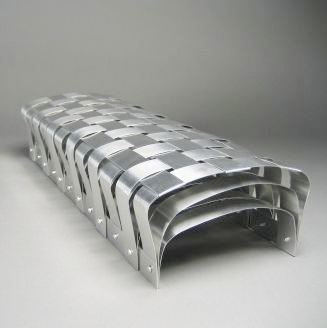 I had no idea, but British artist (and product, interior and exhibition designer) Osian Batyka-Williams did, and realized it was a fabulous opportunity to get inexpensive material for his projects. 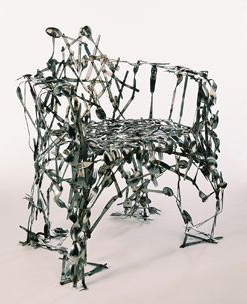 He creates items like these: a very pretty reclaimed cutlery candelabra and this slightly frightening-looking arm chair from spoons, knives and forks. 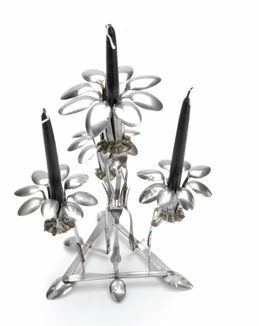 A former shipyard welder, Arizona artist Steve Appel creates his metal art sculptures using bolts, nuts, ball bearings and metal fasteners. Handcrafted and welded to form detailed figures, the 200 varieties include images of people from all walks of life in their daily routines as workers, athletes, etc. 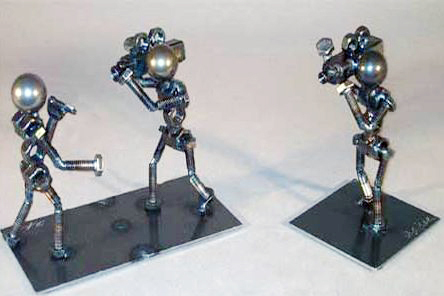 The free-standing sculptures, sometimes with a humorous twist, measure about 4-5 inches high. Artist Laetitia Florin created these malleable wire containers as a graduation project while she was a student at ECAL [in Switzerland]. They are made from fabric-wrapped spring steel and look like huge vases, large enough that a human can fit in them. I find them quite humorous – there is something so uplifting about the way they bounce and move with the slightest touch, and for some reason, they remind me of Barbapapa. 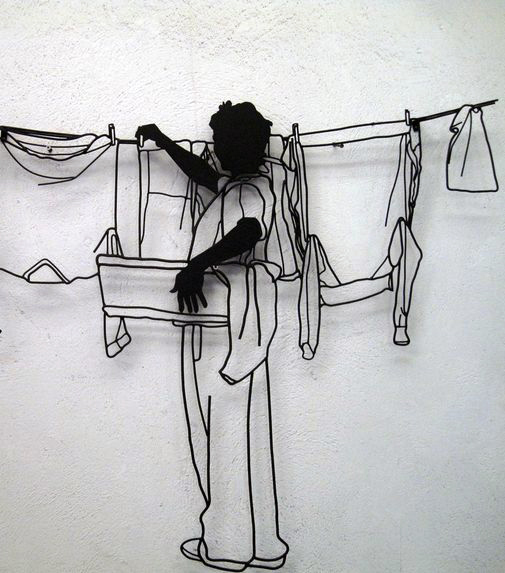 Frank Plant, an American sculptor based in Barcelona creates 3D sculptures described as “drawings in steel.” Themes range from simple stuff (giant shoes, headphones and corkscrews) to portraits of people in everyday activities (vacuuming, hanging laundry, picnicking, etc.) in black and white. They certainly make for unique metal wall art, and his creations can be found in private and public collections worldwide.